The Dialogic Diva BRI-2 Media Board supports one ISDN Basic Rate Interface (BRI). 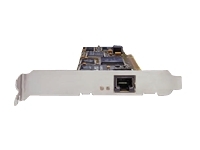 This PCI board is an excellent choice for small to medium-sized businesses since one board can support two concurrent communications with a mix of ISDN devices, V.90 analog modems, GSM mobile phones, and fax machines. Because the Diva BRI-2 is based on open systems architecture, industry-leading computer telephony integration, Voice over Internet Protocol (VoIP), and unified messaging applications integrate easily. The flexibility of the Diva BRI-2 provides network administrators with a simple, cost-effective, and powerful open-communications solution.